Bath Chronicle and Weekly Gazette, Thursday, 13 August 1840. Image © THE BRITISH LIBRARY BOARD. ALL RIGHTS RESERVED. Reproduced with kind permission of The British Newspaper Archive (www.britishnewspaperarchives.co.uk). 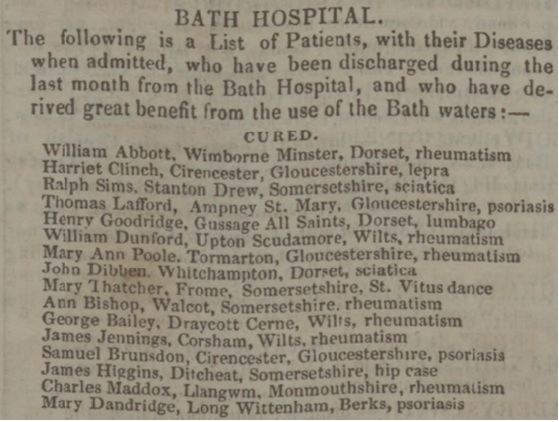 From the 1820s to mid 1850s, the Bath Chronicle and Weekly Gazette published lists of patients discharged from the Bath Hospital who had “derived great benefit from the use of the Bath waters”. It is unlikely that the Bath Chronicle lists were comprehensive, not least because patients who were not “cured” or “much better” were excluded. The details of 217 Dorset patients have been extracted from the lists published during the period 1835 to 1854. Towards the end of the period, the published lists appeared more sporadically. The lists were published every month during 1835-38 and 1840-43, but in the remaining years they were incomplete to a greater or lesser degree, with no lists published at all in 1849. Some of the Dorset patients, like Matilda CHERRETT of Corfe Mullen, received treatment at the Bath Hospital more than once. Others – such as Ambrose WELLMAN, Joseph SQUIBB and William MEDWAY – were treated at the Bath Hospital and at Dorset County Hospital. Surname First name Year Parish Disease Outcome Issue date Pg. no.